Found at the end of a long leafy lane in Gornalwood on the outskirts of Dudley, though technically just inside rural Staffordshire, the Crooked House was first built in 1765 as a farmhouse, and later became a public house known as the Siden House, owing its name - we are told - to the Black Country dialect, in which Siden means crooked. 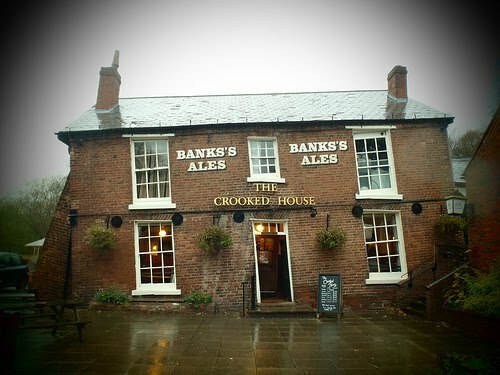 The reason for the crookedness of the house was mining in the area during the 19th century, which caused subsidence and threatened the very existence of the pub when it was condemned in the 1940s, only to be saved by Wolverhampton and Dudley Breweries who embraced the interesting nature of the place and arranged for it to be reinforced with supporting buttresses and girders. Inside, your author found a warm welcome out of the driving rain outside, and discovered that the building is just as crooked inside as out, with heavy doors installed at a slight angle to add to the effect.